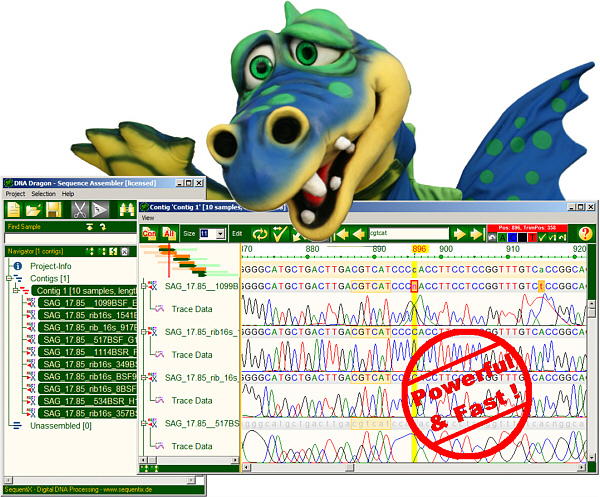 DNA Dragon Contig Assembler assembles sequences (FASTA, GenBank etc. ), trace data (ABI, SCF, AB1), and Illumina and Roche 454 flowgrams into contigs. It is a very fast and accurate DNA sequence assembly software for MS Windows (c) operating systems. The DNA sequences are assembled into contigs and a direct comparision of trace date with nucleotide data is possible. It also allows for proofreading and base editing. Fast and robust assembly machine handles more than 100000 samples from sequence formats (FASTA, GenBank, EMBL, etc. ), trace file formats (SCF, ABI, AB1) and next generation sequencing file formats (Illumina, SFF, GFF, ...). Easy to use interface which accelerates the proofreading and the comparison of nucleotides with trace peaks. XML-conform project files containing all necessary data.